Herbal combination to help ease joints and support mobility. Fast acting, combination of liquid botanical extracts. 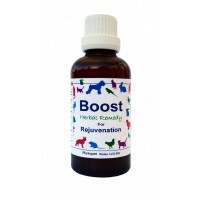 Contains Herbal Tinctures of; Tumeric, Cats Claw, Huang Qin and Boswellia. A combination of herbs shown to have anti-inflammatory properties. + Glucosamine Sulphate, an amino sugar which is one of the building blocks of cartilage. + Essential Fatty Acids (EFAs) exert a natural mild anti-inflammatory effect. They are also useful in removing toxins from the body. + Large doses of vitamin C, 500-3000mg per day, Ester C being the preferred form. + A teaspoon of apple cider vinegar per pint of drinking water.